You are here: Home / What is Cydia? 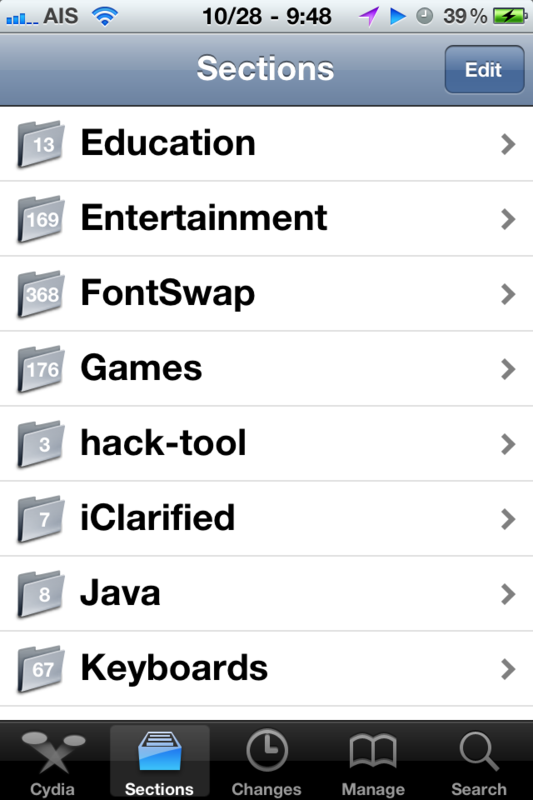 Cydia is an application that allows you to add other applications to your iPhone, iPad or iPod touch. A stock devices comes with many applications from Apple like: Messages, Calendar, Photos, Camera, YouTube, Stocks, Maps, Weather, Clock, Calculator, Notes, Settings, iTunes, App Store, Phone, Mail, Safari, Voice Recorder, Compass and iPod. Cydia is similar to the App Store in that it will allow you to add many more applications such as: games, networking applications, productivity applications…etc. It also allows you to change the look of your iPhone. You can select from a variety of themes that change your icons, wallpaper, dock and status bar. You can even use an application called WinterBoard to changes things like your dialer keypad, your Chat bubbles, the color of the WiFi and Signal bars…etc. In order to get Cydia on your iPhone, iPad, or iPod touch, you will need to jailbreak it. For instructions on how to jailbreak your device, see our f.a.q Page. Note: Again, this jailbreak is only compatible with compatible with iPhone, iPod touch, iPad and iPad mini models running iOS 7.0 through 7.0.6. That means it won’t work on the Apple TV or any devices running iOS 6.x. Also, you’ll want to make sure that you backup your device using iCloud or iTunes. And for those of you who have updated via OTA, you’ll want to back it up in iTunes and do a full restore before applying evasi0n7. Step 1: Download evasi0n7 for Windows via our downloads page. Make sure you download the latest version available. Step 2: Extract the download onto your desktop and open the evasi0n folder. Right click on the evasi0n.exe file and select Run as administrator. If a User Access Control window pops up, choose yes. Step 3: Make sure your device passcode is disabled, if you ever set one up. To disable your passcode lock, go to Settings > General > Passcode Lock > and choose Turn Passcode Off. Step 4: Plug in your iDevice to your PC. Step 5: You should see a message on the tool that it has detected your device, and the Jailbreak button should become clickable. Step 6: To begin the jailbreak process, click that button and sit back and let the app do its thing. Step 7: Eventually, you’ll be asked to tap the evasi0n7 icon on your device’s Home screen, which will complete the process. Step 8: Once the jailbreak process has completed, you’ll be taken to your Lock screen. From there, you can Slide to unlock your device and where you’ll find the Cydia icon on your Home screen’s second page. And that’s all there is to it. The entire process takes around 5 minutes, and your device will reboot a few times. If the process gets stuck at any point, it’s safe to restart the program, reboot the device (if necessary by holding down Power and Home), and rerun the process. It’s worth restating that Saurik was caught by surprise, as we all were, with this release, so he hasn’t had the chance to test things out yet. As such, we imagine you’ll run into issues with both Cydia and your favorite tweaks, so be prepared for initial compatibility issues. Anyway, if you have questions, concerns, or comments, then please leave your feedback in the comment section below. Please be willing to help your fellow jailbreakers as you’ve been so eager to do so in the past. Please tell me easy way to download jailbreck in my mobile device . I try many times acording YouTube but I could not available to install. you know a few of the pictures aren’t loading properly. create your theme? Great work! I every time spent my half an hour to read this webpage’s posts daily along with a mug of coffee. My dad downloaded this app an app called Pangu on my iphone, I think he’s using them to spy on my messages and stuff. Is this possible? Thanks a lot for sharing this with all people you really realize what you’re speaking about! Is Cydia available for iOS 8.3? I have the cydia icon in my iPhone 3.1.3,showing 16 in a small red box.when I tap the icon,it takes so long seaching and never open.what should I do.I really want to download some apps? Cydia has changed so much in the last few years. I remember the earlier days of Jailbreak and Cydia installation with Redsn0w. However, things are getting changed day by day. People are no more interested in jailbreak like they were in 2010. Now we have third-party stores like vShare that allows the same functionality on a root privileged iPhone / iPad device. Furthermore, it allow users to install free apps even without jailbreak. How to get Cydia on your iPhone or iPod Touch.